As you enter you will notice a bath straight ahead and a bedroom just off to the right. The bath offers a corner shower, toilet, and sink, plus a sliding door into the bedroom. You may also enter the bedroom from the hallway. There is a queen size bed, wardrobes on both sides, and a convenient laundry chute. Just inside the entry door to your left, there is a convenient entry closet and kitchen pantry. Next there is a slide out three burner range, countertop space, second pantry, and entertainment center along the curb side wall. The rear features a tri-fold sofa with overhead storage at each end. On the road side, you will find luxury cinema recliners for two, and a booth dinette slide. The refrigerator is located just off the slide near the booth dinette. There is also a convenient island in the middle that features a double kitchen sink for clean up and extra counter space for prep work. 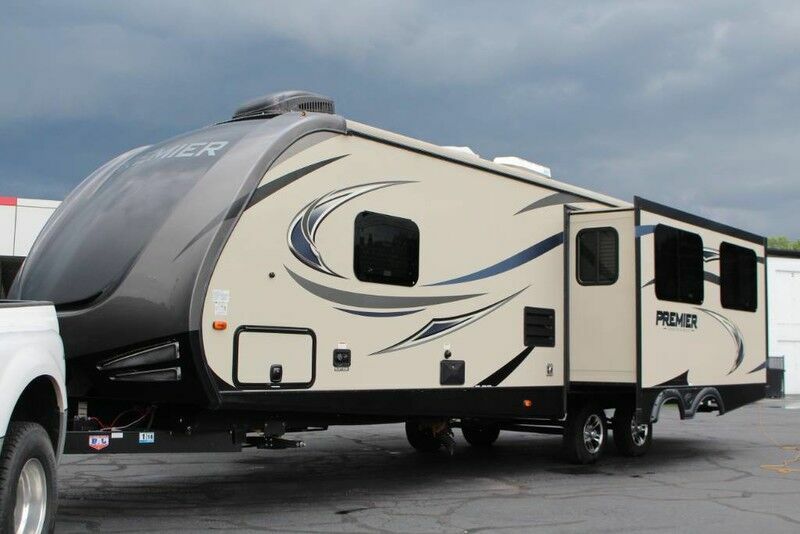 There is no lack of storage on the inside of this trailer, and the outside features a pass through compartment with access on either side, plus an outdoor kitchen, and so much more!